This tip of the day/tutorial will tell you why these are not the best options, and what you can do to improve your bowling game. Having the ball curve is actually a great way to knock more pins over. The problem is that most people do this with the house ball (the ball they have for you at the bowling alley). The reason professionals curve the ball is because they have bowling balls designed to spin. The ball is weighted differently specifically so it will spin. The holes on the ball are also different so that the ball is gripped to allow the bowler to bowl in a way that will curve the ball. If you try doing this with the house ball, you will be inconsistent and it puts a lot of stress on your wrist. You can do it for fun, and you may have occasional success, but you will more than likely be inconsistent. Sometimes you will get strikes this way, but it is not the best way to bowl. Bowling this way often results in splits. You want to place your feet in between the three dots furthest to your right. There are two rows of dots. Depending on how tall you are and personal preference will determine which row you use. I tend to use the row furthest back to get more power. When you bowl, you don't want to look at the pins. You want to look at the arrows. Aim for the second arrow from the right. This will place the ball in the 1 and 3 pin pocket. This is the best area to hit the pins and will usually result in a strike. If you bowl slightly to the left and go in between the 1 and 2 pins, this is also good. This will usually not result in a strike (sometimes you get lucky though). Often it will cause a split. If you hit the center pin head on, you can sometimes get lucky, but usually this will not result in a strike. You will find when bowling this way, occasionally one pin will stay up. Generally the 7 or 10 pin. To get the 7 pin. Keep your normal stance and aim for the arrow third from the right. 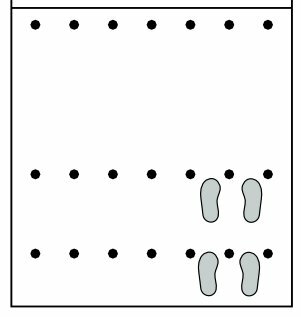 To get the 10 pin, change your stance to be in between the LEFT three dots, and bowl for the arrow third over from the left. Bowling a 200+ game is all about consistency. The reason you want to pay attention to your footing and where you bowl the ball is so that you can be consistent and make small adjustments if necessary. Once you get into your groove, pay attention to what you are doing and be consistent with it. Take your time to focus before each bowl. Rushing into the bowl will lead to small mistakes. I'm bowling a 200 tonight!